Moving to Paris is possible if you take a series of simple steps. Here’s what you need to know from finding an apartment to getting a visa. In 2010, Justin and I visited my little sister Haley in Paris while she was going to pâtisserie school at Le Cordon Bleu. 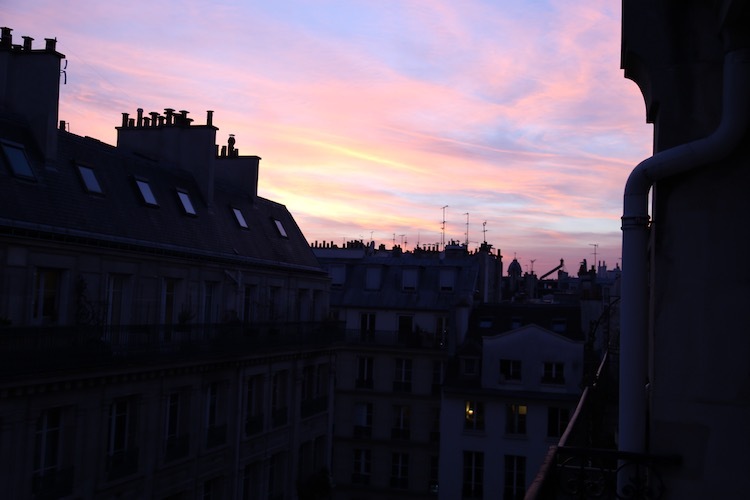 She had an adorable apartment in the 9th arrondissement with a view of the Parisian rooftops and the Palais Garnier. We were there for the summer solstice and experienced Fête de la Musique, a magical night where restaurants and bars host live music throughout the evening. We ate at Le Chateaubriand for the first time. A dream meal. We did not want to leave. We got engaged on this trip. As soon as we returned to San Diego, I threw myself into planning our wedding, but the idea of a move to Paris had been planted. We made our dream of living in Paris a reality through a series of small steps. We began saying things like “Wouldn’t it be wonderful to live in Paris ourselves one day.” Justin began taking Rosetta Stone French. After we got married, I became a freelance food and travel writer. I was writing primarily about the West Coast, but I badly wanted to expand my reach. I realized that if I wanted to write more about Paris and Europe, I would probably have to live there. In 2013, our musings about living abroad became more serious. When our landlord told us that he wanted to move back into the apartment we were renting at the time we thought “maybe this is the shove we’d been needing?” We set an estimated move date of January 2014, just after the holidays. We planned to live in Paris for one year. Living in Paris is just as magical as you imagine it to be. Justin and I started telling everyone we were moving in the spring of 2013. I believe this is an important step in turning any dream into reality. You have to vocalize what you want. That way you hold yourself accountable and start taking the necessary steps to make it happen. 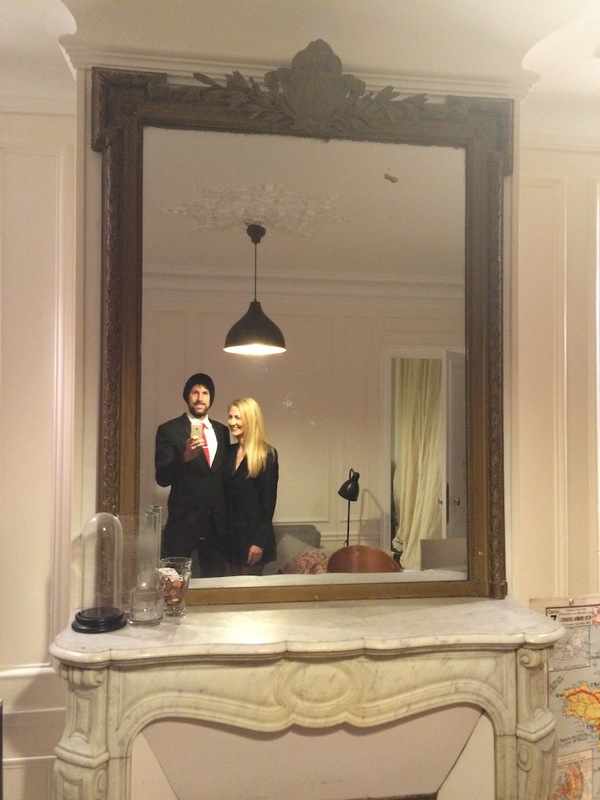 We found our dream apartment in the 4th arrondissement. Through research, Justin and I found that if we were planning to be in France for more than three months in a 180 day period, we would need a long-stay visitor visa. There are four long-stay visa categories. They include: to stay for tourist or personal reasons; to carry out a professional activity; to pursue education and to join family members. While I had hoped to pursue my career while living abroad, I found that the requirements you must meet for carrying out a professional activity while living in France were challenging to satisfy. I was planning to write for American publications who would be depositing funds in my American bank account and so we decided to apply for the tourism/private stay visa. This did not entitle us to work in the European Union. We began the process of filling out a visa application. To do this go here, but before you start, read this webpage explaining the visa application guidelines. The main things you need to complete your application are proof of enough funds to cover expenses during your time in France (these can come from yourself or a guarantor), health insurance and proof of residence while you’re in France. This could be hotel accommodations for the length of your stay, a property deed or rental agreement. This leads me to the next step. I had pretty high standards for my dream Parisian apartment. I wanted parquet floors, Mansard roof views and a modern kitchen. The only websites I knew of at the time were geared towards short stays in the city including Paris Perfect and Haven In. While the apartments are beautiful, the prices are more on par with a luxury hotel stay then with an apartment rental. Through my father’s contacts, I found out about a website specializing in long term furnished Paris apartment rentals called Book-A-Flat. The apartment fees are listed by the month, not by the night, and you can search by neighborhood. I had my heart set on living in the Marais which includes the 3rd and 4th arrondissements and we ended up with a beautiful two bedroom in the 4th. The apartment was perfect. 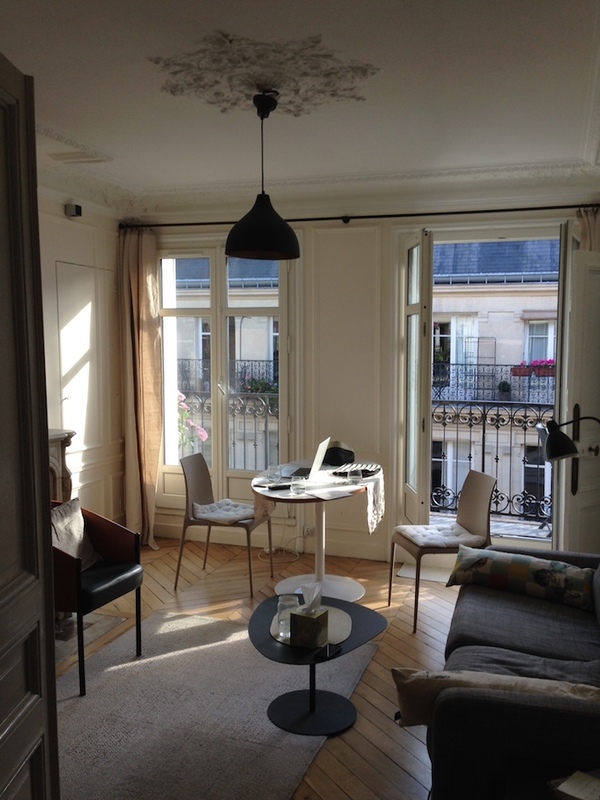 It was located on the 5th floor with a balcony on the most charming pedestrian-only street, Rue du Trésor. By going through Book-A-Flat when you move to Paris, you will have to pay a fee equivalent to one month’s rent for a 12-month rental. Be aware that you may be required to pay for the apartment in full or have a French guarantor. We had to pay a security deposit equivalent to two months rent. We did eventually get this back. Our apartment was 2,200 euros a month, but it is possible to find something wonderful for much less. Other websites where you can search for apartments include Airbnb, VRBO, Paris-Housing and Paris Attitude. Haven In does offer some long term apartment rental options now as well like the Voltaire apartment in the 11th which is available for a minimum nine-month stay. 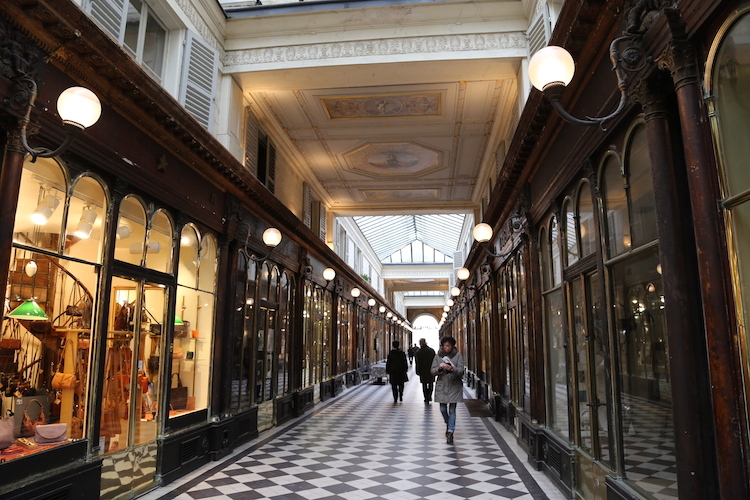 This could be you strolling through one of Paris’s covered passageways when the city quiets down in the wintertime. We mostly flew Delta/Air France or American Airlines to Charles de Gaulle airport in Paris. Make sure you have a mileage account because you will rack up miles if you plan on making trips back and forth to the US. When you have your living arrangements secured, then you can complete your application and book an appointment at a VFS Global Center. There are locations in San Francisco, Chicago, Los Angeles, Miami, Houston, Atlanta, New York, Boston and Washington DC. Make sure you allow enough time before your departure date to schedule an appointment to have your application reviewed. Check on the average appointment wait times to ensure that you are able to submit your application three months to two weeks prior to your departure date. A long-stay visa costs around $125. 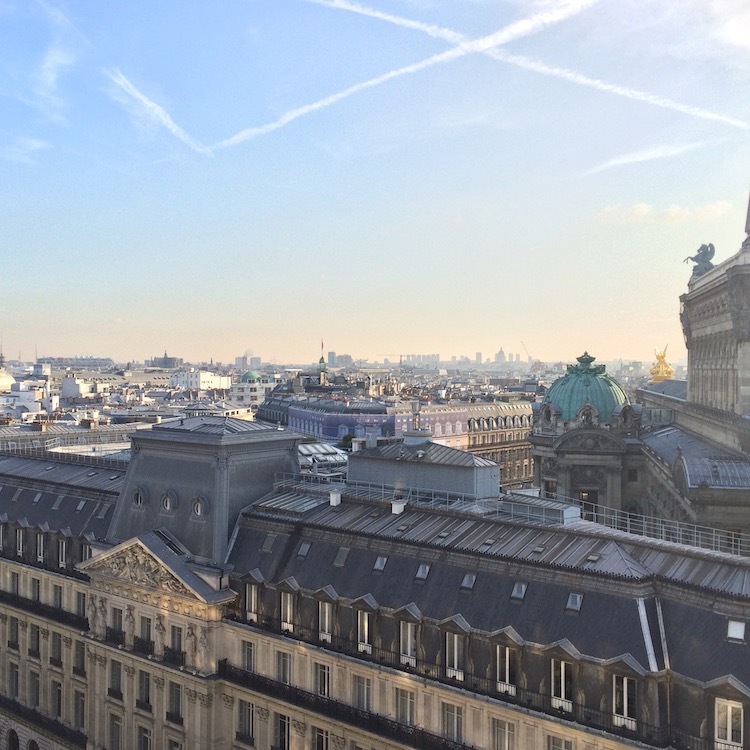 A view of the city from the terrace of Galeries Lafayette. Justin and I both did Rosetta Stone French before and during our stay in France. Justin really went all in and listened to it in the car and through headphones while he worked out. He improved immensely. When we moved, I felt like I would benefit by taking a course and I enrolled in a beginning French class at Alliance Française. We both found that meeting and becoming friends with French people and forcing ourselves to speak French with them was by far the most effective way to learn the language, even if it meant bumbling our way through and making mistakes. During its period of validity, the long-stay visa is equivalent to a Schengen Visa, allowing you to move around and stay in the Schengen Area outside France for periods not exceeding 90 days over any period of 180 consecutive days. In order to extend your stay beyond the period of validity of your visa, you must apply for a residence permit at a prefecture in Paris. And if you’re anything like us, the prospect of staying another year or more may be too enticing to pass up. In 2011, I wrote a note card that said: “I will be sitting on my balcony enjoying a croissant in Paris in the fall of 2014.” It took until January 2015, but it happened. 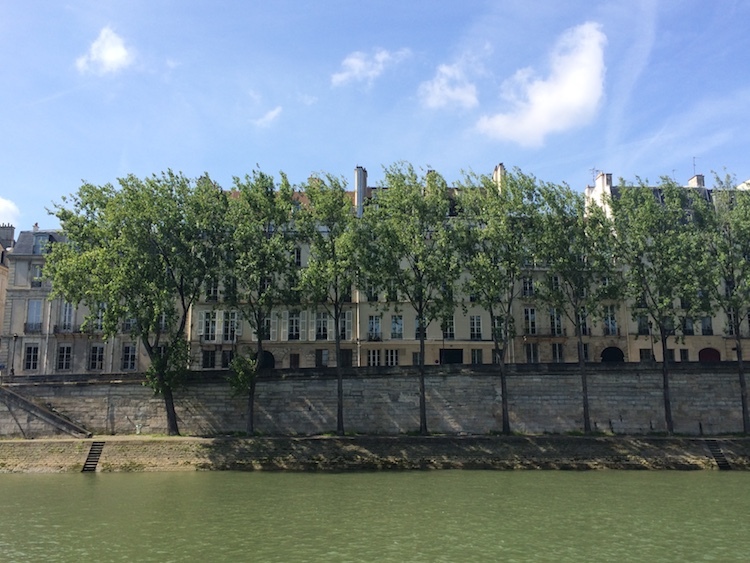 Renting an apartment ahead of time through a website like Book-A-Flat is a substantial chunk of change, but we found that the cost of living in Paris was reasonable. Things like wine, fruits and vegetables and public transportation are not expensive. 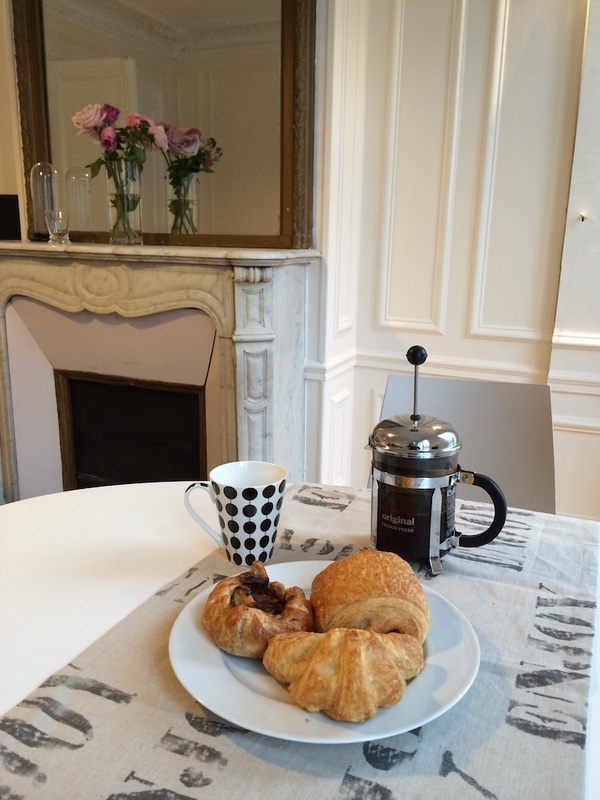 Once you’re in Paris, it will be easier to find out about apartments through word of mouth. Consider looking for something you can rent directly from a landlord so you don’t have to pay agency fees if you decide to stay another year. 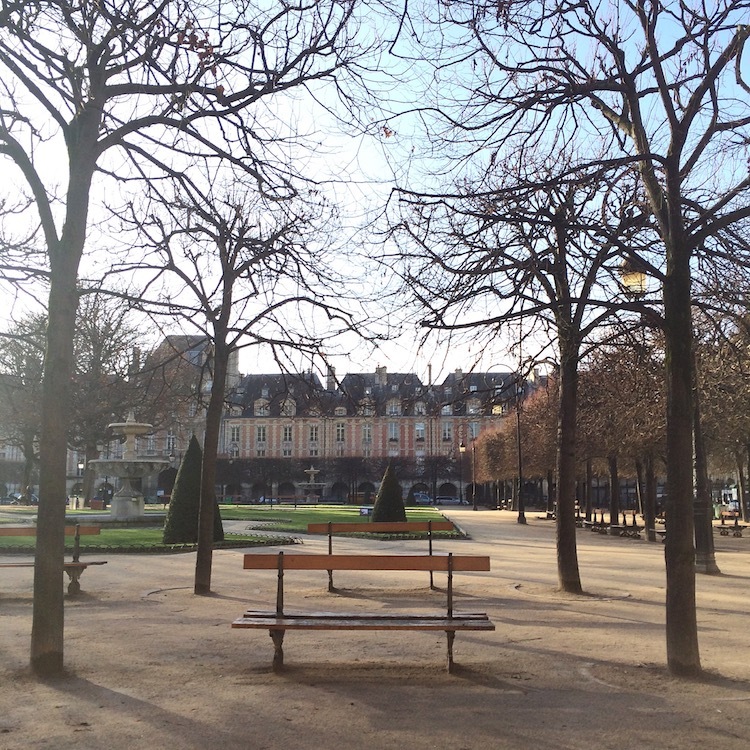 A quiet morning in Place des Vosges. If you rent an apartment, you will have to buy rental insurance. It should only cost a few hundred dollars for the year. Our policy was through French Furnished Insurance. In France, even if someone else in your building does something that causes damage in your apartment, say there is a leak in the bathroom above and it damages your ceiling (happened to us), it’s your insurance policy and not your landlord’s or the other tenant’s who will pay for it. Experiences applying for a visa can vary wildly based on what center you go to and who you end up dealing with. Try to stay patient, be polite and have faith that everything will work out in the end. Once you arrive in Paris, you will need to enjoy the cafes and restaurants as the locals do. For my guide to Paris including where to eat and drink go here.